I don’t usually talk about ownership here on MetsPlus, but after watching the drama over Terry Collins impending departure, I feel like I have to at least share my thoughts, even if it’s not pro-Mets in the least. First, as I’ve stated many times to Twitter, I’m not a huge Terry Collins fan, I believe he makes many questionable in-game decisions, frustrates fans, answers some questions the wrong way from the media, and does make your head spin. Despite that, Collins has been able to rally the team to two postseasons, including a NL Pennant. On top of that, every player I’ve spoken to and everyone around the team has spoken extremely highly of him and his personality in rallying the troops. However, if you were new in town and saw the media coverage and “leaks” you would think that Terry Collins is the worst person to ever step 100 feet from Citi Field. In brief, the Mets seemingly blamed Terry for Familia’s injury, and also reported that they seriously considered firing him during multiple points in his tenure. Like him or not, TC was one of the most successful managers in #Mets history. Pretty ridiculous this org is trashing him on his way out. So look, here are my thoughts in a nutshell via an analogy: When you own a bus, and the bus driver has been working the same route for seven years, and, despite some shortcomings, you don’t stab the wheels of the bus driver THREE DAYS before his tenure is over. And, to add insult to injury they are quietly doing it without saying that they are doing it. Maybe I shouldn’t be this upset, but my frustrations with the Mets have been through the roof, and I question rooting for a team with owners of such poor morals. Here is the Mets Intro Montage for the 2017. This is played prior to the Mets taking the field. This past Friday evening, with absolutely no plans (yes, I do have a social life, I do appreciate your concern, though) I decided going to the Mets game (by myself) would be a fun activity. Typically, I don’t go to games by myself, I’ve only gone by myself two or three times in my life, but when I do, I find that I actually really enjoy it. So, I jumped on the secondary market, and found promenade tickets for as low as $2, but decided to “splurge” for a $15 ticket on the Field Level. I arrived to my favorite sight, no lines and no metal detectors. Instead, I was subject to a quick wand check, and spoke to a friendly security guard. As part of Fan Appreciation Weekend, a special scratch & win card and a Citi Rally Towel were given away to all fans. The Mets also advertised some other perks and special appearances (some players even scanned tickets on Saturday), but I didn’t see anything else. I then decided to take a quick walk around the field level, just to gauge the atmosphere at the game, and took note of the many food options that I’ve never tried. While I do like new and unique food options, I pretty much stick to Shake Shack, Chicken & Fries from Nathan’s, and the occasional Fuku Chicken Sandwich or Lobster Roll from Catch of the Day. So, I decided to try the “Mex Burger” without Avocado from Keith’s Grill. With the $11 burger, you get a bag of Wise chips and a Tootsie Roll, the only place in the entire ballpark that gives you un-advertised “extras” alongside your main. There were no line’s at Keith’s, and it tasted pretty darn good. While I had a Field Level ticket, I ate my meal up in the Excelsior Level. The views are far better up there, and you don’t have kids running across the aisle chasing their favorite player for an autograph. I’m not saying I don’t like that, I was running around cutting people off when I was young too, but I enjoy the Excelsior Level considerably more most of the time. I then decided to head back down to the field level for first pitch, where I stayed for the first five innings. My ticket was located next to a Nationals Fan who was amazed that I was keeping score. Supposedly it’s an extremely rare site at Nationals Park, and he commended me for rooting on the Mets even through the tough times. I countered with the fact that you have to watch the bad baseball to enjoy the good baseball, and he agreed. I then decided to switch things up and head back to the Excelsior Level, I’ve always found the bathrooms to be considerably more clean in the Excelsior Level, so once I went up there to use them, I decided to stick it out up there for the rest of the game. One of my favorite non-game moments was the Piano Man sing-along, something that is played during -most- home games at Citi Field during the middle of the eighth inning. The good news was that after Billy Joel, and after the Mets went down in the bottom of the eighth, we were only three outs away from securing the win versus Washington, and, after three relievers came in, we got the job done! So this wasn’t the most important Mets game I’d ever been to, but it was an exciting day with the best fans in baseball, and I’ll look forward to cheering them on two more times before calling it a quits on the 2017 Mets. A longstanding tradition at Mets games is the Veteran of the Game, presented by FirstData. Typically, the Veteran of the Game is announced during the middle of the fourth inning, and is occasionally broadcasted on either SNY or PIX 11, if the time permits. And while not everyone cares for it, I think it’s awesome that fans can recognize a veteran, and have them meet a Met and receive a commemorative flag. If you’ve never seen it, SNY has a compilation of all of the veterans receive their gift. Obviously, I don’t expect anyone to watch all (or any) of these, but it is a very nice gesture that I rarely see outside of Queens in major league stadiums. You can watch all of the clips here, on SNY.tv’s website. #ThePlusInMetsPlus: Redeeming my Miles another way…..
On today’s #ThePlusInMetsPlus, we take a break from the Baseball to talk about Golf. Not to farfetched, right? Well, what does Golf have to do with Frequent Flyer Miles? Read on to find out! Baseball is my favorite sport. Aside from Baseball, I like Hockey, Golf and Tennis, and Football when the time is right. Last year, I went to the Barclays Black Course in Bethpage, and I’ve been intrigued by the PGA Tour ever since. This year, through the MileagePlus Exclusives program, I got tickets to the Genesis Open, in Santa Monica, CA, but here’s the catch, I didn’t purchase any tickets, my Premier Status allowed me to redeem miles for the United Fairway Club, right in front of the 17th Green. I simply logged into my MileagePlus account on the official MileagePlus Exclusives page, and everything was processed from there. Members without Premier Status could bid on these exclusive experiences buy using their MileagePlus award miles. The VIP treatment started two weeks before the tournament, as I was given the tickets in a huge box via FedEx. The box included the tickets with nice United Airlines lanyards, parking passes, and a separate Calaway Golf “repair kit” with a tee, four golf balls and markers. This was a pretty awesome gift and a great omen for the trip! Fast forward to Genesis Sunday, and the aforementioned parking pass really came in hand. The VIP pass gave us access to the valet lot right behind the 18th Clubhouse, which really helped us get in and out in a flash. The walk down the path was beautiful, with the sun starting to come out of the clouds just as the players started teeing off. The club was next to the AT&T, Bank Of America and Mercedes-Benz tents. I was welcomed by the representative, given a wrist band and we were off. Upon entering, we were given a golf towel by a friendly check-in representative that made us sign photo release forms. There were outlets, flat screen TV’s, air conditioning, leather couches, a full buffet (more on that later) and those advertised views of the 17th Green. There were three rows of comfortable seats, all overlooking the green with TV monitors showing the replays overhead. There was rain the day before, so there was pressure to finish play before sunset. The event lasted from 11am to around 5pm. The catering was pretty good, similar to what you would see at a great airport lounge. There were make-your-own Chicken Sandwiches, Salads, Brisket Mac and Cheese, Toppings, Pickles, breads, all in addition to a fantastic full bar, which served non-alcoholic and alcoholic beverages free of charge, I stuck with the cranberry juice, but my parents quite enjoyed the alcoholic selection, which has delivered by the courteous bar tender. To start, I had some of the brisket mac & cheese, which was extremely tasty, and probably the most memorable food item on the whole buffet due to it’s uniqueness. When the golfers made there way to the 17th hole, I made myself a delicious Chicken Breast Sandwich, with some toppings, accompanied by a thirst quenching Cranberry Juice. This truly felt like a VIP experience, and something that should cost way more MileagePlus miles. Comparing it to something that I understand, a suite at Citi Field, which doesn’t come with any food, starts from $5,000 per game, so this was an incredible deal. We were encouraged to share the experience on social media using #MPExclusives, which I did throughout the day. Towards the end, I had some of the dessert, thinking the culinary part of the day was over, but no, it was time for the snacks! This time there was Seasonal Fruit, Chips, Mini Hot Dogs etc. which I continued to enjoy. We might have just had the luck of the draw, but the weather was fantastic, and the fact that there was an overhang protecting us from direct sun was a huge plus. After the last group of players (Perez, Johnson and Triangle) finished playing, I said goodbye to the staff at the United Fairway Club, who were very nice and super friendly, and even gave us a few more towels before we left. We then “followed” Johnson up the 18th Green and saw him finishing the tournament off with a great putt. Overall, this whole event was superb, and United did a great job putting it together. I would highly recommend doing something like this if you have a stash of United MileagePlus Miles that you aren’t utilizing. Thanks to United Airlines and the Genesis Open for being amazing hosts and offering great hospitality. MetsPlus.com will officially be leaving MLB.com, in two days. And before that happens, I wanted to share with you my Top 5 all-time posts on MetsPlus.com, since we joined MLB.com in April of 2014. There are a LOT of posts that I’ve written over the past few years that I’m extremely proud of, but after an extensive review and a lot of decision making, I believe I’ve settled on five posts that I’d call my favorite. Yes, after interviewing some of the games best, doing some amazing things, eating my way through Citi Field was one of my favorite memories. While, the PIG GUY NYC Bacon on the Stick was very memorable, I also enjoyed the Fuku Chicken Sandwich, Box Frites, Keith’s Burger and all the other places that we went around to see. I might do a Part 3 of Culinary Citi in 2017 if the Mets add some new options to the ballpark fare this Spring. This pick is most likely a sympathy pick, as over the years I have interviewed people a little more well known than Branden Wellington, however, I was amazed by the professionalism and the willingness of the first person I ever interviewed for Mets Plus, and, it was truly an exciting interview. In the interview, Mr.Wellington shares his game day routine, favorite experiences, and on-screen moments. Had the Mets actually won the NL Wild Card game, this would have been considerably higher on the list, maybe even at #1. This was the first time for me doing a personal recap of a game I attended, and I enjoyed it immensely. Looking back at that game two months later, I realize how amazing that game actually was, and how close the Mets came from playing the Cubs at Wrigley in the NLDS. You have to give me some credit for putting a Top 5 List in a Top 5, huh? Well, the Winter Meetings truly was action packed, and there were a lot of moments that were extremely unforgettable. The Trade Show was probably at the top of that, but meeting some of my favorite TV Personalities, speaking to Job Fair candidates, and interviewing a guy that was holding a sign in the lobby. This was truly a memorable and amazing week. I mean, how can meeting Mike Piazza not be at the top of the list? This is actually two blog posts, the first part was my time in Cooperstown, New York for the induction ceremony, and part two was the actual number retirement, which I enjoyed a little more. This, without a doubt, is my top Mets related memory of all time. Should you get a Mets 2018 Plan? Per usual in September, the Mets have been bombarding me with emails and flyers suggesting that I sign-up for a 2018 Mets ticket plan. During the last homestand, while making my way around the ballpark, two ticket reps openly walked up to me and basically pleaded with me to sign up for a plan. Obviously, I have no lack of respect for these reps that are doing their job, but I thought it’s time I address this head on. At it’s face, buying a Mets ticket plan is a lot like Amazin’ Mets Fan Photo. It’s completely unnecessary, it’s annoying with the emails and in-person requests, and it’s more expensive, and the only real benefit of indulging in the product is to have tangible security that your memory will be in-tact. Some skeptics still heckle me on Twitter suggesting I’m wrong about this, so here are my responses to some of the common frequently asked questions regarding Mets ticket plans. This year, I attended 28 games at Citi Field, with the expectation to attend two more in this last homestand, so I’d have attended 30 of the Mets 81 home games. I actually paid out of pocket for about 23 of them with five of those games being freebees (ClubMets, friends, Food Drive, corporate, etc). So, if I were to get a plan, I’d get the 20 game plan. My favorite section to sit in is 308 or 329, in the Excelsior Box, with would cost anywhere between $26-80 depending on the game. On StubHub, even for the best games, these tickets are routinely available for less than $25, and in most instances (like the Friday game) I can purchase a ticket for $13, far less than the $50 I would be paying up-front. Even when StubHub fails (which is extremely rare), I can always use one of the Mets many buy one get one deals to drag the price down by 50%, and the only blackout restrictions for those games are Opening Day and the Subway Series. You don’t have Guaranteed seats for games…..
Can someone tell me why I would want that? I don’t know when I’ll take a vacation in 2018, I don’t know when I’ll get ill, or have to run for a family emergency. Purchasing single game tickets guarantees that you go to games that you want to go to, not games that you feel you have an obligation to go to because you paid for it, even if you are under the weather. Right, but what about Opening Day and the Postseason, I want those seats confirmed…. I get that, and, yes, Opening Day and the Postseason is far more complex than all the other games, so I think this is where one has to take an educated approach into their decision making. As my friend Jeremy Posner said on Twitter this morning, he would rather splurge on Opening Day than get locked in for the entire season, and I, personally, agree. Typically, you can get into the stadium for $45 on Mets.com or the secondary market, just ten dollars more expensive then a seat in Promenade Outfield with a plan. So, it doesn’t take a mathematician to figure out that it’s better to lose out on one game, but then win (price wise) on the rest of them than the other way around. You didn’t mention the Postseason! True, that is the one place where plans come in handy. Still, I think that with the allure of the Mets postseason less exciting as it was two years ago, I wouldn’t necessarily say it’s smarter to lock into a plan than playing it day by day. That being said, if the Mets were a winning ball club, I might have more reason to consider a plan…. If I went Single Game, I’d lose my perks…. I do understand this, even if it sounds deranged. I have relatives that hold on to credit cards that are counterintuitive to their financial life only so they can have a card that shows they were members “Since 1992”. So, while it’s completely meaningless to me, I do understand (in the vaguest sense) holding on to a season ticket to show off your seniority as a fan. 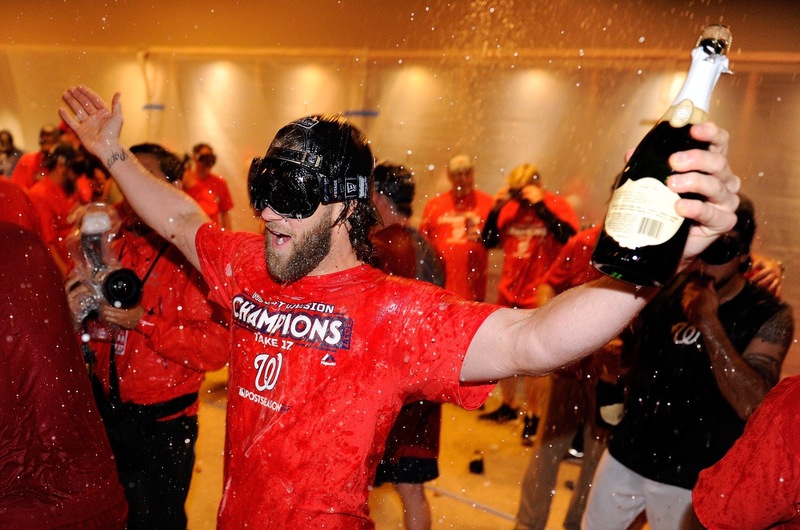 To end 2017 on the worst note possible, the Nationals won the NL East. The year that some predicted would be the best year in Mets history had turned into one of the absolute worst, and Daniel Murphy and the Nationals will be heading into the postseason with the National League East crown over their heads. This obviously comes at no surprise, as it has been evident since May that the Mets weren’t up to the challenge, and the Nationals, while not perfect, had no issues claiming the title. This has been a really tough year to be a Mets fan, one of the worst years I can remember. However, we have to go out there, root on the Mets, and go through these down periods if we want to enjoy the good times. That’s baseball, if it was predictable, we wouldn’t watch. So go out there and root on the Mets this last homestand, or root from your couch. It’ll be a long winter ahead of us, and over hald a year until we see the Mets play exhibition games in Port St. Lucie. It’s time to throw 2017 out the window, and get behind #Mets2018. For the first time in a while, there is quite a bit of Blue! Home White Pinstripes: 11 games out of 14. Paired with Primary cap. Blue Home Alternate: 3 game out of 14. Paired with Home Alt cap. Road Grey: 9 games out of 16 paired with Primary cap. Road Blue Alternate: 3 games out of 16 paired with road alternate cap.